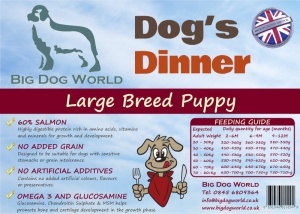 Ultra Premium Large Breed Puppy Food from Big Dog World. 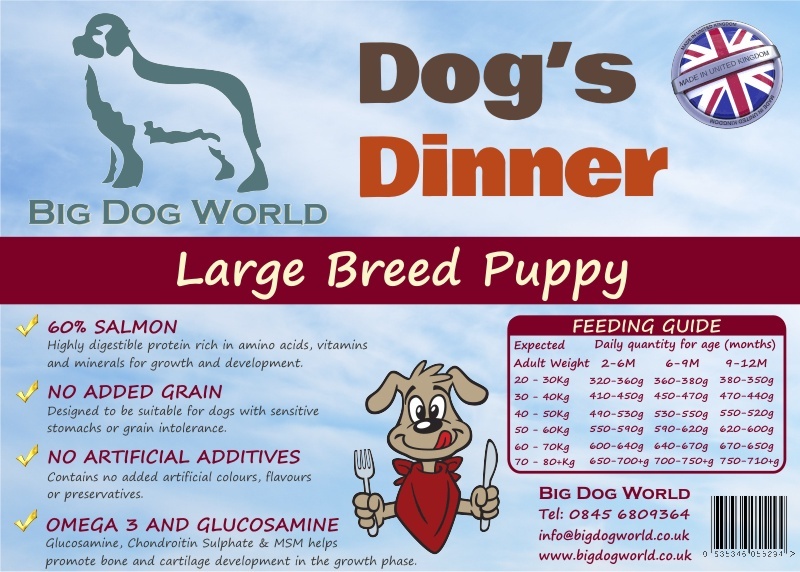 Dogs Dinner Large Breed Puppy with Salmon is a delicious recipe for large and giant breed puppies. With a larger kibble size plus added Glucosamine, Chondroitin and Omega-3 for healthy coat and joints. Dog's Dinner Large Breed puppy food is made in the UK and contains no added grain, making it suitable for dogs with sensitive digestion or grain allergies. It also has no artificial additives such as flavourings, colours or preservatives. Salmon 60% (40% Freshly Prepared Salmon (Including 1% Salmon Stock) & 20% Dried Salmon), Sweet Potato (19%), Potato, Beet Pulp, Linseed, Minerals, Vitamins, Omega 3 Supplement, Dried Carrot, Peas, Vegetable Stock, Glucosamine (355 mg/kg), Methylsulfonylmethane (355 mg/kg), Chondroitin Sulphate (250mg/kg), Nucleotides, Prebiotics - FOS (92 mg/kg), MOS (23 mg/kg). Own brand large breed puppy food is excellent. Ingredients compare favourably with the likes of much more expensive brands and just the right protein/fat ratio to support rapid but heathy growth .